Sounds Familiar is a web page, provided by the British Library, about British accents as the UK is abundant in regional accents and dialects, a strong and live evidence of local history as far as continuity and change are concerned. The great thing about this page is that you can click different regions of the UK and immediately get the pronunciation of different words across the UK. 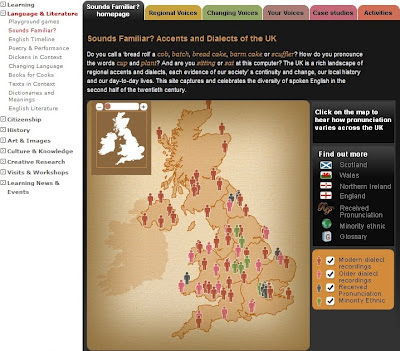 As it is explained on the page, "You can listen to 71 sound recordings and over 600 short audio clips chosen from two collections of the British Library Sound Archive: the Survey of English Dialects and the Millennium Memory Bank. You’ll hear Londoners discussing marriage and working life, Welsh teenagers talking with pride about being bilingual and the Aristocracy chatting about country houses. You can explore the links between present-day Geordie and our Anglo-Saxon and Viking past or discover why Northern Irish accents are a rich blend of seventeenth century English and Scots. You can study changes in pronunciation among the middle classes or find out how British Asians express their linguistic identity." You have read this article British accents / British Library / pronunciation / UK with the title British Accents. 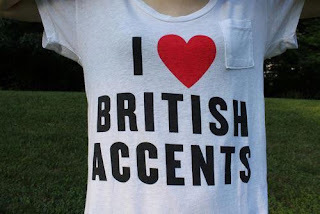 You can bookmark this page URL http://catolink4.blogspot.com/2012/06/british-accents.html. Thanks! No comment for "British Accents"